Dennis Lajola returned a shot to Luke Jensen last night. Luke Jensen is past his physical peak at age 39, and his biggest accomplishment as a world-class tennis player came in doubles competition 13 years ago. But the fact remains that 16-year-old Dennis Lajola of Aiea beat a former champion of a Grand Slam event when Lajola took just 45 minutes to dispatch Jensen, 6-2, 6-0, in an exhibition match last night as around 100 watched at Central Oahu Regional Park. Jensen, who won the 1993 French Open men's doubles title with his brother, Murphy, sported a newly shaved head yesterday because he lost his annual Christmas match against his brother. He's now 0-for-2 on holiday bets: After his loss to Lajola, Jensen donned a plastic hula skirt to honor the pre-match wager he suggested. "I guess I have to wear it a week, since I got bageled," Jensen said of the second-set shutout. "That's the Hawaiian tradition, isn't it?" The jovial Jensen didn't let losing lopsidedly to a teenager bother him, and he didn't use the hours of teaching clinics before last night's match as an excuse. "He's an outstanding player. I'm just happy to be in Hawaii," Jensen said. "I'm lucky I get paid to play tennis and show these kids how much fun it is. This used to be a conservative game, now we have music, rock 'n' roll tennis." Lajola dominated from start to finish, winning the first three games. Jensen never broke Lajola's serve, but the ESPN analyst was impressed by other aspects of his game. "First of all, he's extremely quick," the 6-foot-2, 190-pound Jensen said of the 5-10, 155-pound Lajola. "You've got to be able to scoot around the court at every level, get behind the ball to be offensive and defensive. He's got a lot of pop on his strokes, and a lot of guys do, but he was able to mix it up and keep me off balance." 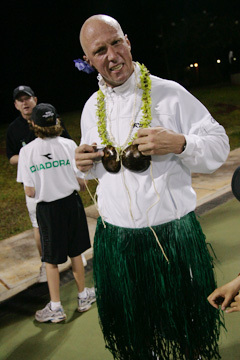 Luke Jensen was jovial after losing to 6-2, 6-0 Aiea's Dennis Lajola in an exhibition match yesterday, donning a plastic hula skirt to honor the pre-match wager he had suggested. "I guess I have to wear it a week, since I got bageled," he said. Lajola, the ITF's 81st-ranked boy under 18 last year, is headed to the Australian Open junior main draw next week. He said he wasn't nervous going up against the ambidextrous "Dual Hand" Luke, who served left-handed about half the time last night. "I felt like I could move with him pretty well. I just felt good for some reason. Probably because it's a night match and I play good at night," Lajola said. "I give it up to Luke Jensen for playing me, it was really an honor for me to get a chance to play him." Jensen provided continual commentary in the first set, teasing Lajola when he made a rare error and praising his plentiful aces and cross-court winners. "You've just got to stay focused while he's trash talking. Just worry about your own game, but that can be tough sometimes," said Lajola, who was quiet throughout the match. Lajola, who has traveled the world playing in top junior tournaments, said not all opponent banter is as good-natured as Jensen's. "You hear it all the time, especially the Europeans," Lajola said. "I played a guy from Croatia. We were battling it out in the third set and he was talking and talking and he kind of got in my head." Jensen said he was impressed with Lajola's discipline throughout a lopsided match. "I tried to get into his head, talking to him, the crowd, the ball boys, just to see if he flinches. He didn't give me any unforced errors. When I would come up with something, he had the speed and presence of mind to come up with a good shot," Jensen said. "Mentally and physically, he definitely has the tools. What really impressed me is what he did beyond his A-Game plan. The ability to come in and serve and volley when the match was in hand, work on different aspects of his game on this stage, shows a lot of maturity. He was consistently transitioning, usually you have to force someone out of their comfort zone. "I'm excited to see how he does. See how he plays against the big boys and how he moves up."